Carnival Splendor is in the league of its own. It is a large 13 deck ship with an even bigger personality. 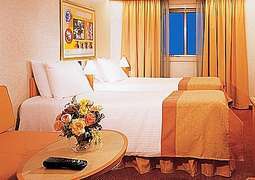 If you are looking for a fun, value-packed cruise holiday, Splendor is the ship for you. Enjoy 'Dive-In Movies' - great film screenings set under the stars by the pool, have a splash in the pool even if its balmy - Splendor's retractable sky dome covers the pool when the weather worsens. Let the kids be entertained by one of the many age-appropriate programmes, while you play mini-golf, listen to some jazz at 'The Cool' club or try your luck at the 'Royal Flush Casino'. 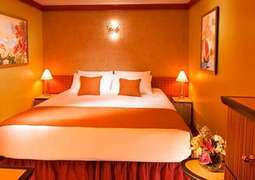 Fun isn't the only thing Splendor is good for, rest and relaxation is another one of the ship's mottos. 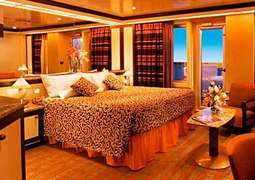 Check out the grand, two-deck Cloud 9 Spa - the most elaborate in the whole Carnival fleet. There is a Thalassotherapy pool, a dry heat chamber, a state-of-the-art fitness centre and much more. If that isn't enough, seek respite swaying in one of the hammocks with a cocktail in your hand on the adults-only sun deck - the Serenity Retreat. 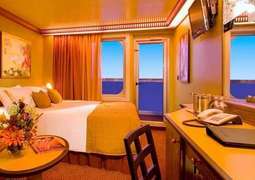 The Carnival Splendor has a great variety of stylishly furnished cabins, including inner cabins, outer cabins with fantastic views and private balconies with great maritime flair. No matter which cabin you choose, an impressive and comfortable stay is guaranteed. Pamper your palate with fabulous cuisine on board the Carnival Splendor. The elegant À la Carte Restaurant and specialty Steak House are only two highlights among many fine dining options. Enjoy delicious dishes in the pizzeria, at the sushi bar, or in the Bistro with an impressive ocean view. The Carnival Splendor offers an extensive recreation and relaxation programme, based in the 2.000 m² sized wellness area. In addition to multiple swimming pools, a special thalasso therapy pool is also provided. Relaxation and rejuvenation aren't the only options, however, as numerous clubs, bars and lounges offer fun and excitement all day and night. There you can enjoy spectacular shows and concerts, comedy acts and performances by international artists, or you could try your luck in the casino. The Club 02 offers parties, games and land excursions for teens, whereas younger guests are invited to come have fun at Camp Carnival. Sports enthusiasts are sure to be pleased with the diverse fitness offerings aboard the Carnival Splendor. You can work out and take various exercise classes in the fitness centre, or stay active in the fresh sea breeze on the basketball and volleyball courts, jogging on the athletic track or playing a round of mini-golf. Find rejuvenation in the spacious spa area, where you can treat yourself to many wellness treatment offerings, including massages and manicures.